Last summer, I bought a copy of Shin Megami Tensei: Persona 3 Portable for the PSP. I'd heard nothing but fantastic things about Atlus's role-playing game slash high school simulator, and I figured it'd be a good opportunity to bolster my RPG street cred. A few months later, when I finally opened the game, it gave me disc error issues. I couldn't play more than the first few hours without my game freezing up. No problem, I figured. My PSP-1000 is pretty old. The Vita is coming out soon. I'll just start a new game on the new system, even if I have to pay five or ten dollars to digitally transfer my PSP disc. No big deal. Oops. Several weeks ago, Sony said its UMD transferring program would not be available in the U.S. The rationale? "It's a combination of things," Sony head of worldwide game development Shuhei Yoshida told Kotaku at the D.I.C.E. summit this year. "Number one, demand is much stronger in Japan... The other thing is that, if you look at the library of PSP games available in the U.S., lots of games are already very cheap and affordable... When you look at the price of PSP titles, great PSP games like Final Fantasy Tactics, for $9.99 it's a really good deal." Except for the ones that aren't good deals. Like Final Fantasy IV, which is $30 on the PlayStation Network despite shipping for $20 at GameStop. Or Kenka Bancho: Badass Rumble, which is $40 on the PlayStation Network and $25 at Amazon. Kotaku reader Deacon Ross sent in this photo showing the disparity between PlayStation Network and retail prices for Kenka Bancho: Badass Rumble. Persona 3 Portable is up there for $40 too, a significant price leap from the $19 it costs Japanese Vita owners to transfer their physical copies. "So what?" you might be thinking. "This is the Vita, and all it needs to do is play Vita games. If you want to play PSP games, use your PSP." The problem is that Sony is marketing the Vita as the only portable device you'll need. The PlayStation publisher has to compete for consumers' attention in a world where multi-tasking smartphones and tablets let us game and tweet from wherever we want, whenever we want. That's why the Vita's interface — which is sleek, sharp, and impeccably user-friendly — is far more reminiscent of an iPhone than any game console you've ever seen. It lets you play music, watch videos, and even browse the web using 3G wireless Internet, if you buy that hardware version. 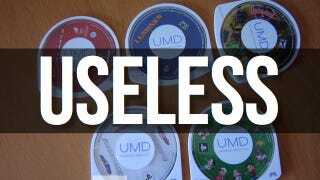 But by forcing loyal PSP owners — some of whom have been buying physical UMDs for the past seven years — to re-buy their old games, Sony seems to be at odds with its own message. "This is the only device you need — unless you want to play the games we sold you last year," the company seems to be saying. The Vita's library of old PSP games is also fairly incomplete. Some games I would certainly like to play, like Final Fantasy VII: Crisis Core, are nowhere to be found on the Vita's digital store. Maybe one day I'll re-buy Persona 3 Portable on my Vita. If I want to play the game, I might not really have a choice. But it's tough to understand what Sony could possibly be thinking here — and it's tough not to be angry about it.